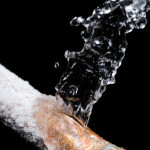 Another great product I found while checking out Kohler’s newest Products. 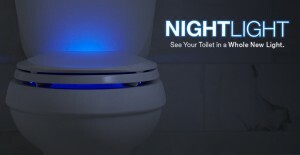 The Nightlight toilet seat with two unique LED light displays that illuminate your toilet in a soft glow. Perfect for anyone who needs to use the bathroom in the middle of the night. The guiding light, located in the seat’s hinge, is visible with the lid down. It projects a gentle glow onto the toilet’s tank so users can easily see the toilet area when entering the bathroom. No need to flip a switch and brace yourself for the harsh bathroom that wakes you up and makes getting back to sleep that much harder. Nightlight runs automatically on a seven-hour cycle so you don’t have to worry about leaving it on during the day or turning it on every night. With just the push of a button, you program the first cycle, and the Nightlight will activate at the same time every night. 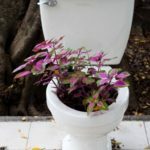 The slim, low-profile toilet seat runs on four “AA” batteries for up to six months, so you don’t have to deal with messy cords or wires that add clutter in your bathroom. Not only does it guide you in the middle of the night, the Nightlight comes with the Quiet-Close™ feature that prevents those rude awakenings commonly caused by a slamming seat, and Quick-Attach® hardware and Quick-Release™ functionality let you easily install the seat and remove it for a thorough cleaning.